Tickets and performance schedule at www.georgestreetplayhouse.org. There are heroes and then there are heroes. That seeming incongruity is brought home with searing clarity in Christopher Demos-Brown's "American Hero," running through February 25 at George Street Playhouse in New Brunswick. And while its tone is opposite that of "The Outsider" (see companion review), the two plays share a defining trait: they are both steeped in cynicism. 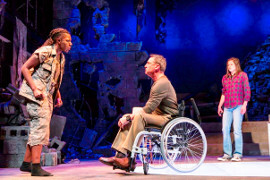 At Paper Mill Playhouse, "The Outsider" skewers politics with comedy, while "American Hero" takes on the American military establishment. Both plays speak to the efficacy of Theatre as a message-medium (and to the quality and variety of New Jersey’s Regional stages). "American Hero" at George Street Playhouse. Photo coutesy of George Street Playhouse. "American Hero" opens with a remarkably vivid battle scene, staged on designer Jason Simms economical set. Upstage of an interior space, it evokes an Iraqi forest-tangle, where, later in the play, the harrowing conflict is enacted in more detail. The scenes depict the heroism from different perspectives: the first one of clear-cut bravery, the second more nuanced – still courageous, to be sure, but colored, if not marred, by surrounding circumstances. Marine Captain Robert "Rob" Wellman (Armand Schultz) is awarded the Medal of Honor for his actions in that Iraqi encounter. The citation, we learn, carries multiple privileges and a near-mystical aura within the military, prompting those in the vetting process to over-emphasize some of the narrative and omit some, which Rob, after token resistance, signs off on. Over the course of a tight 95 minutes we learn much about the outer and inner lives of Rob and Mary, from their battlefield bond to their post-Iraq trajectories – his upbeat on the surface, despite being wheelchair-bound, and hers a downward spiral exacerbated by her being female, African-American and a lesbian: a triple whammy. Rob treats his 17-year old daughter Shawn like one of his enlisted leathernecks, some of whom could probably not do twenty push-ups as efficiently as Kally Duling does inn her excellent performance. ("Quick twenty before you go," Rob commands his daughter.) Scenes between Mary and Shawn, one upon meeting and then later sharing intimacies (and a doobie) are both heart-warming and amusing. George Street's artistic director David Saint stages the battle scenes and the many post-Iraq transitions with seamless efficiency. John Bolger plays eight roles, including the U.S President, some supercilious Marine officers and a beat cop. While we know it’s the same actor, each character is a distinct individual, a credit both to Bolger and playwright Demos-Brown. Significantly also, Schultz adjusts Rob's relationships with each of the eight in a multi-faceted performance. Captain Robert Wellman is a sympathetic character. Or is he?